Say you're in a hotel and you've had the triple burrito, bran muffin and double latte? Or maybe the kids just put too much TP in? Here's a trick. SLOOOOOOWLY depress the handle and allow the bowl to fill with water. You don't want to do a full flush and overflow the bowl. The pressure from the greater amount of water will many times push the clog down allowing the bowl to flush. It works in a lot of cases. If it doesn't, the water will eventually drain back down to a normal level. You may want to remove the lid from the tank so you can see the position of the flapper. Just push the handle a little to allow it to open slightly. My son who watches too much TV remarked something about the zombies wouldn't get his shoes because they didn't need them. Ignore that for the moment. That's a whole other story. He's his father's son though because I thought, well, yes they do, in fact they need good shoes. You know, because they're dead on their feet. Here's a good one. 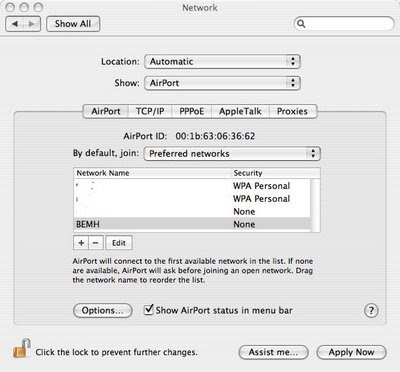 I could join an open WiFi network on my iPhone but not on my Macbook. It kept asking me for a WPA password. There is no password of course on an open network. What I had to do was go into the network settings under system preferences and edit the network it had 'memorized'. In this case, it's 'BEMH'. So, open System Preferences, then select 'Airport' by 'Show:' and then the Airport button below. Just make it look like the above screen capture. Click the network you are trying to join, then click Edit, and select 'None' for 'Wireless Security:'. To sum: Your Mac thinks you need a password and you have to tell it otherwise. It worked perfectly after this. Yeah, so there is no DRM any more. Many people say that might lead to people buying their music elsewhere or using a different device. Or not buying as much music. Wait, what? I'm now MORE likely to buy there than before. The sole reason I WASN'T buying there was because I could not use my music on another device, should I choose. I have an iPhone. I use iTunes. I buy from Amazon.com mainly because of no DRM and because of the good sales they have on albums. Do people think that Apple was selling songs on iTunes because that was the only place to buy music? That only songs purchased there could be used on an iPod? This is America; the average person doesn't know that there are other options. I bet most people don't even import their music from CDs into MP3 format. (Yes, it can be done by changing your preferences folks.) What makes Apple successful is the fact that it is so easy to use and so integrated. I.e., the user experience. By removing DRM, they've only made it more likely that the rest of us will buy there. And people aren't going to switch off the iPod because it's works so well with iTunes. I say, it's an improvement and will only increase market share. The people buying music at the iTunes store won't turn into thieves overnight just because the copy protection was removed.